As you are aware on the last day of 2016, December 31st the Governor presented the 2017 budget to the State House of Assembly. What the budget showed us was that, Education was given the highest allocation of 27.3% which is higher than the UNESCO recommendation of 26%. This thing did not happen in isolation because last year too education got the highest of 28% of the total budget . The whole idea behind this is that, in Sokoto State, education is the number one priority of this administration and we set out from the beginning that the deplorable state of education sector in Sokoto has to be reversed, has to be changed. Two years ago, we declared a state of emergency in the education sector in the state and within last year, in September 2015, we set the target of 1.1 million new enrollment of children , by August of 2016, we had 1.3 Million, we beat our target. We don’t just care about enrollment of students in schools, we care about retention and completion. So within the circle of enrollment, retention and completion, we give special consideration to female education. Very soon this year the Governor has approved the establishment of the agency for girl child education to coordinate the activities of the girl child. So basically, Sokoto and Governor Tambuwal have been about education since we made it the number one priority of the administration and all state government expenditure and attention, all state government energy has been tailored towards revamping the education sector in the state. The important thing is that within the one year of the declaration of the state of emergency, visible impact had been made. Some of you might have read online about Gudu local government area in Sokoto state, which is the only local government in Nigeria without a senior Secondary school, out of the 774 local government areas in the country. So is a negative statistics which if we are really serious about turning around the fortunes of education, we should make a visible impact in that local government. The state government budget 1.1billion Naira for a brand new secondary school, which is perhaps the biggest secondary school in Sokoto. Because Gudu is on the border with Niger Republic. The state government entered into an agreement with Niger Republic and the school will now run a dual curriculum in French and English, with teachers from Nigeria and Niger Republic and students from Nigeria and Niger. When you run a dual curriculum it is very important because, you are exposing Nigerian students to French and you all know that we are surrounded by French speaking countries. So we are improving the marketability of our students , if they go to the outside world, they can speak English, their local dialect as well as French. There are about 200,000 people in Gudu , for the first time they are seeing what it is to have a Senior secondary school , it will be a borden school and co educational and housing students from Niger and Nigeria. What we did was that, we zero down on six crops which we feel Sokoto state has comparative advantage over every other state in the country. These include cowpea, rice, wheat, sesame, tomatoes, onions, ginger, these crops we decided to pay very strong attention to them. Few weeks ago the CBN Governor was in Sokoto for the launching of the anchor borrowing scheme for wheat farming and normally anywhere you hear anchor borrowing is rice farming. But in Sokoto we expanded it to wheat farming and within the two years that this administration has been on. We have supplied fertilizer consistently for raining season and dry season farming. In the healthcare sector, the transformation in Sokoto is visible because now there are 244 political wards in Sokoto and each and every one of these wards has a primary healthcare. All the wards in Sokoto has a PHC built and equipped by the state government to functional standard. It is about taking healthcare to the grassroots level. Also we sent our students abroad for further education. You are aware that the SURE-P of the past administration, there were nurses and midwives trained by the program. So the state government felt all those trained should be absolved by the state government. 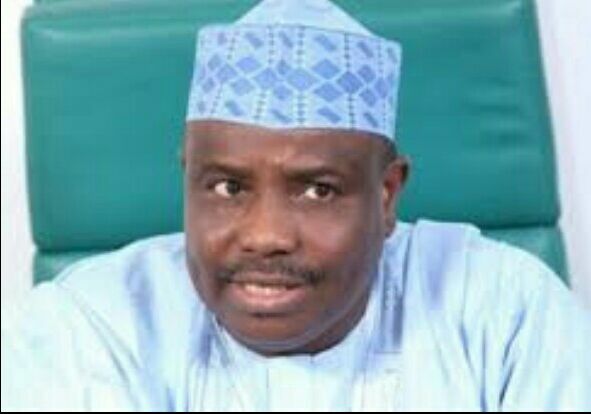 In Sokoto, what we do is that if you are an indigene of Sokoto state and you are reading Medicine or Nursing , from your first semester the state government begins to give you salary and allowance and other educational expenses to ensure that they are fully equipped and by the time you finish your school. We absolve you straight into the state civil service if you want. Basically, the idea is not to lack in those critical sectors. Another sector that the state government has made impact is social and communal harmony. You don’t hear of disharmony in Sokoto from what ever angle; either religious or ethnic angle or anywhere. The resident community in Sokoto has been so appreciative of the efforts of the state government and we have involved them in basically all decisions making and carried them along when introducing major policies that will impact on governance in the state. Through the state media, information is passed in English, Hausa and pidgin for the benefit of non indigenes and other residents in the state. In public schools in the state, all thpupils, students pay the same fees if there are fees to be paid. Generally it is free, but if the need arise at all it is the same fees. Whether indigene or not. So, communal and Social harmony is very critical and important to the state government and we have maintained a strong bond with all, especially the Christian community because the trust that exist is paramount and the respect can be felt across board in the state.